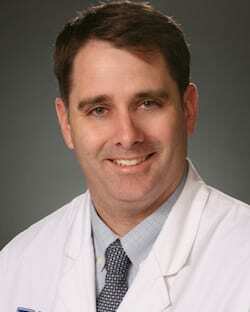 Dr. Chris Crean is a board-certified Emergency Physician. He earned his BA in chemistry from the College of the Holy Cross in 1997 and his MD from Georgetown University Medical School in 2003. Chris completed his residency in Emergency Medicine at the Carolinas Medical Center in Charlotte, NC in 2006 and was awarded the Outstanding Resident Research Achievement Award. He then went on to join the faculty at the University of Massachusetts Medical School as an Assistant Professor in the Department of Emergency Medicine. In 2011 Chris and his family moved to New Jersey, where he joined Emergency Medical Associates. Currently, he serves as the Associate Director and Department Chairman for the Emergency Department at Robert Wood Johnson University Hospital – Somerset Campus. Chris was a camper for many years at YMCA Camp Belknap. He was invited to serve as a cabin leader, division head, and, ultimately Program Director. Chris and his wife Theresa, a sign language interpreter, have two children: Lilian, born in 2005, and Joshua, born in 2007.